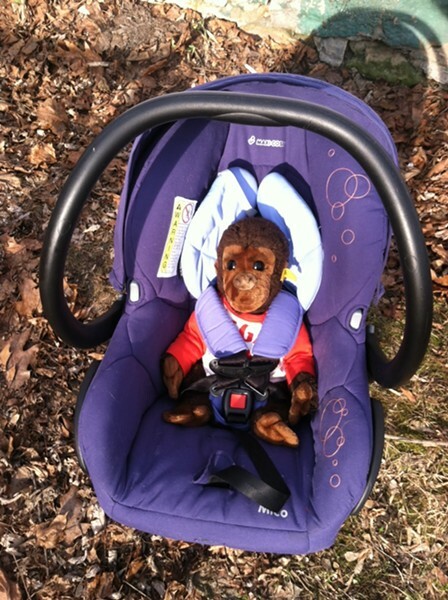 The car seat is set up and ready to go, thanks to Gori, my favorite childhood chimpanzee. For a few hours last Friday, my husband and I considered the possibility that we were about to become parents — not three weeks from now, as we had been expecting, but, like, now. Earlier that day, at my 36-week ultrasound appointment, my doctor found that my blood pressure was unusually high. She decided to send me to the hospital to be monitored and tested for preeclampsia. Left untreated, the condition can develop into eclampsia, which causes seizures, and even death, in the mother. The only way to treat it is to deliver the baby. If I did have preeclampsia, my doctor told me, she'd want to induce labor right away. Despite that scary description — and the fact that the disorder killed Lady Sybil on "Downton Abbey" — I wasn't all that worried. Both my mom and grandmother had high blood pressure at the end of their pregnancies; they were fine. And my baby on Friday was just two days away from 37 weeks, technically full term. If she had to come out now, she'd be ready. Still, while I sat there in the Fletcher Allen triage room in my hospital gown, listening to the galloping of her heartbeat on the fetal monitor, I wondered, Am I ready for her? We've set up the crib and the car seat. We've accumulated more onesies than we have space to store them. We've picked out her name. But, if she showed up tomorrow, would Daniel and I be ready to start taking care of her, every day, for the rest of our lives? I scarfed down the peanut-butter toast the nurse had brought me and imagined bringing our baby home. We'd have to be ready, I thought. That's how it works, right? We're about to dive into the unknown; we'll never be fully prepared. We're excited. We want this. We're as ready as we'll ever be. When my test results came back, they showed that everything was fine. So I went home, thankful to have just a little more time.